Induction cooking is fast, safe and easy to use. That’s why the use of induction is increasing worldwide. But along with its comforts comes the concern for health. Many people wonder if the magnets are safe for use or not. We will try to analyze the question from every possible angle here. As we know, an induction uses a magnetic influx to heat the pan and do the cooking. Knowing this, some questions arises at this point. 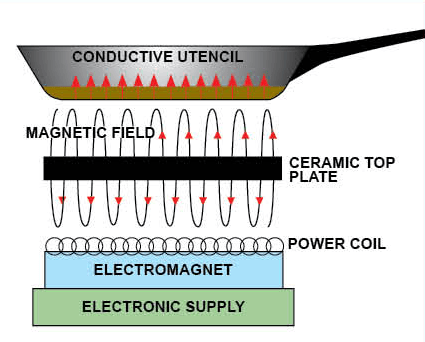 When you turn on an induction cooktop, the copper coil beneath the surface passes along the magnetic field to the pan. It doesn’t pass heat directly. You may even turn on an induction for a long time and then place your hand on the surface. You will find that the surface is cold. There is absolutely no heat on it. Only when you place a pan on the surface, then the pan, not the surface, gets heated. So there is no chance of a burn on your hand or body from an induction. Yes, if you touch the pan after it’s hot, that’s a different issue. And if you use a steel spoon to stir your foods, you might get an electric shock. But who would do that, right? So always use plastic, melamine or wooden spoons and you are safe as a baby cat in the mother’s womb. What about Magnetic Field Exposure? Yes, now that’s a thing we should be talking about. See, an induction runs on Electromagnetic Field. If you turn an induction and leave it open that way, it will emit radiation. True. And this radiation exposure can acutely stimulate your nerves and muscles. But how much amount of radiation is leaked and will that amount has the ability to harm a human body are probably the two questions everybody trying to get an answer for. When you turn on an induction, it emits a very small amount of radiation. That radiation amount is 50 times lower than the magnetic field threshold value for a human body. You can avert this tension of exposure completely, by using a pan which has a base with a similar span of the induction hobs so that the hobs are fully covered. The best way is to place the pan first and then turn on the induction. You can also avoid the radiation by standing at the designated distance from the induction. The study shows that the chance of being affected by the radiation is absolutely zero if a person maintains a 1 foot (30 cm) distance from the induction. Some people are also worried if a person having set a pacemaker can use an induction. They ask the question, “Does the electromagnetic interference create a problem with the pacemaker?” Well, let’s hear it from an expert. From the study “Induction Ovens and Electromagnetic Interference: What is the Risk for Patients with Implanted Pacemakers?”, by H. Rickli, M. Facchini, H. Brunner, P. Ammann, M. Sagmeister, G. Klaus, W. Angehrn, R. Luechinger, and F. Duru , this report shows that there is no EMI risk of an induction kitchen appliance like induction oven or induction cooktop in patients with bipolar or right-sided unipolar pacemakers. This study was published in Pacing and Clinical Electrophysiology, Volume 26. It’s said in the study that though there is no risk, the person with pacemakers should maintain a distance of 50 cm rather than the regular 30 cm for overprotection. But if you are still feeling any inconvenience, don’t forget to consult with your cardiac specialist. After all, health is wealth!